The six major dairy importing nations in Southeast Asia—Indonesia, Malaysia, the Philippines, Singapore, Thailand and Vietnam—are up for grabs. The United States and the world’s other three major dairy suppliers—Australia, the European Union (EU), New Zealand and the United States— are in a hotly contested battle for dominance, with the prize a fast-growing region that has a much greater need for milk than what its respective countries can provide. In 2014, we each held a double-digit share of the region’s dairy imports. Over the last five years though, there has been a significant shift away from Oceania and toward the EU and United States. New Zealand and Australia saw their combined share of Southeast Asian dairy imports slip from 55 percent in 2009 to 42 percent in 2014, according to World Trade Atlas data. 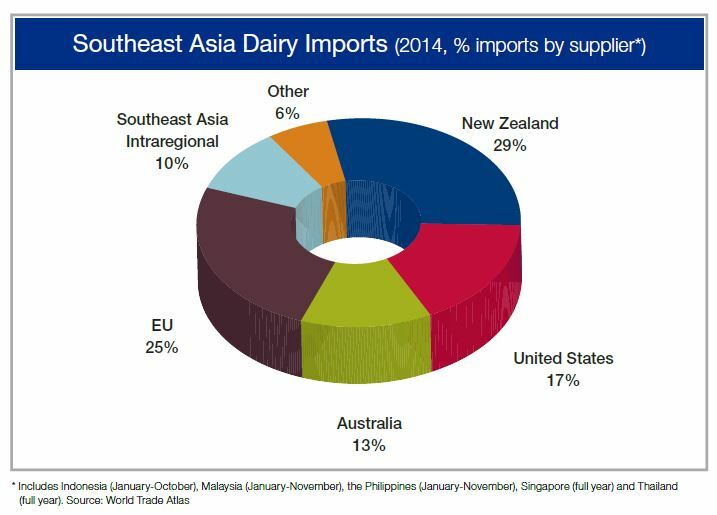 By contrast, the U.S. share of Southeast Asian dairy imports grew from 12 percent in 2009 to 17 percent in 2014, and the EU expanded its slice of the pie from 18 percent to 25 percent. Results vary from country to country and product to product, but the overall trend is clearly a favorable one for the United States. As the senior vice president for strategic and industry communications for the U.S. Dairy Export Council I am leading a mission to the region consisting of four U.S. dairy farmers, all Dairy Management Inc. board members, and two dairy trade journalists. In fact, I am writing this from Ho Chi Minh City (Saigon), Vietnam, where the temperature is expected to hit 95 degrees today, appropriate for this hot market. That is good advice for any U.S. dairy supplier wanting to do business here. In this video shot in Singapore by Hoard’s Dairyman, two of our farmers -- Kima Simonson of eastern Washington and Harold Shaulis of western Pennsylvania – analyze the opportunities and some of the challenges, including managing spore counts to ensure quality. Simonson echoes Geiger in saying this is a region where buyers value ongoing, face-to-face relationships. From a competitive standpoint, U.S. suppliers have had the greatest success in the Philippines and Indonesia. 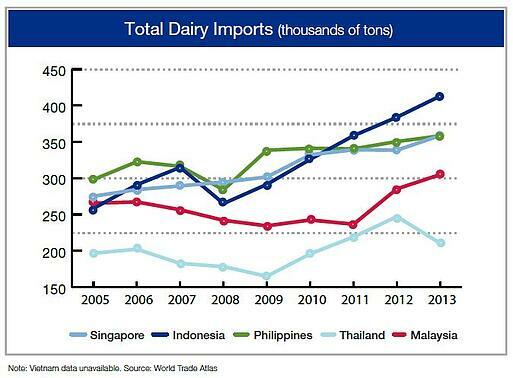 U.S. share of Indonesian dairy imports rose from 15 percent to 21 percent over the last five years, while share of Philippine dairy imports grew from 14 percent to 24 percent over the same time period, according to the World Trade Atlas. The atlas does not track Vietnam, but according to USDEC research, the United States is the dominant supplier of whey products and lactose to Vietnam with shares in excess of 60 percent, and is responsible for more than a quarter of the nation’s SMP purchasing.